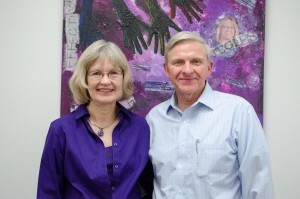 Marilyn and Bill Taylor visit the College of Education to meet with students returning from their study abroad trips. Philanthropists Bill and Marilyn Taylor, Olathe, Kansas, created scholarships that have provided nearly 200 preservice teachers with a study abroad experience after their daughter, Megan, was killed. She was struck by a vehicle while riding a bicycle on a high school band trip in Germany.